Sara Eisen: just before Kudlow took the stage, I did have a chance to catch up with him as he entered the chamber and got some news about how the white house is thinking about shutting down the border. Listen. Larry Kudlow: We’re watching it and looking for ways to allow the freight passage. Some people call it truck roads. And there are ways you can do that, which would ameliorate the breakdown in supply chains. The president’s positions on border security are well known, I support them fully. I mean, the numbers, hundreds of thousands immigrants every month. It’s crazy the question is, can we deal with that and not have any economic damage? I think the answer is we can and people are looking at different options, particularly, if you can keep those freight lanes, those truck lanes open. I mean, that’s probably the nub of it. Eisen: what about the workers? Hundreds of thousands of people coming over here legally to work and not to mention the tourists. Kudlow: yeah. Well, that may be difficult. I don’t want to comment on it because we’re playing right now to try to, you know – what you want to do is stop the emergency and the breakdown and you want to try to limit whatever harm that does. It’s a very difficult task. I think it’s doable. I don’t know where the president will make a final decision on these things, he hasn’t yet. So we’re looking at all those options. Eisen: I imagine you’ve been in touch with business here at the Chamber of Commerce. They’ve been pretty outspoken on the need to reduce economic fallout around this issue. Kudlow: well, they’re right and I agree with that. Eisen: Larry Kudlow saying for the first time really the white house and he in particular are looking at options to mitigate any economic fallout that would occur as a result of shutting down the U.S. Mexican border. First time he really laid out specific plans about keeping freight lanes open, or truck lanes open, as to not disrupt the supply chains. It’s something we talked about earlier with the U.S. Chamber of Commerce president Tom Donohue who said that’s a big concern here because if you shut down the border, what happens to the auto workers and the parts that come across the border every day in production? I mean, more than a billion dollars worth of goods is traded. 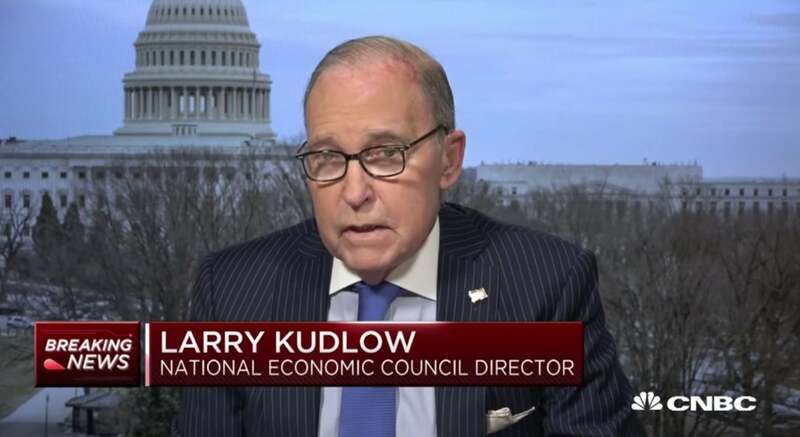 Kudlow couldn’t say anything about the workers that come across legally or the tourists as you just heard, but he did say they are looking at ways of containing the economic damage. He also, guys, confirmed to me he is still pushing for Stephen Moore to be nominated to the fed board. Stands behind him fully and he and the president are not worried about any of he allegations against Mr. Moore including he did not pay child support for instance and some of the other sort of controversies that surround him.